I might as well just admit it -- holidays are for eating. It is for indulging in food that I usually do not eat during the year. For me, the holidays mean sweets, baked goods and comfort foods. To be more specific -- cookies, mugs of hot cocoa with marshmallows, popcorn, cinnamon and spice breads, etc. Holidays are cookie exchange parties, trying new recipes in my kitchens, the smell of beef and potatoes stewing on my stove, the giant bag of cheese and caramel popcorn that Mr Sweetie brings me, gifts of chocolates, caramel apples if I am lucky, and the pastries that constantly appear in my office suite as if by magic (and magically disappears as well! Ha! Ha!). 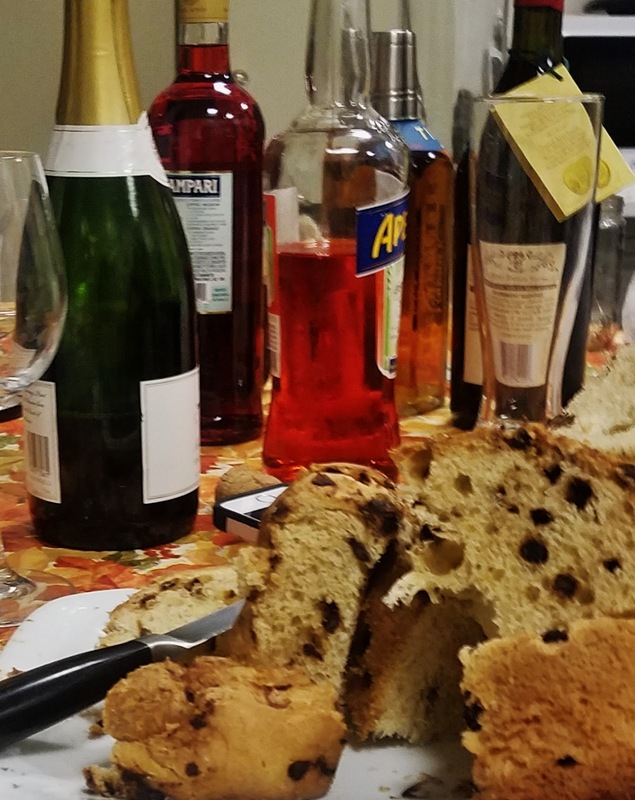 Eating during the holidays is really not really just about food. It is about comfort among friends and family, festivities, celebrations and warmth. Diet is for next year, for now, I want love, in the form of food and laughter and friendships and family and intoxicating bubbles. I lusted after these donuts after seeing pictures on Instagram last fall. I looked and looked and finally gave up trying to find these donuts at my local Trader Joe's. Then one day, and only for one day, I found them without even looking for them. These cakey cinammony donuts were yummy and worth the wait. Then they were gone again. 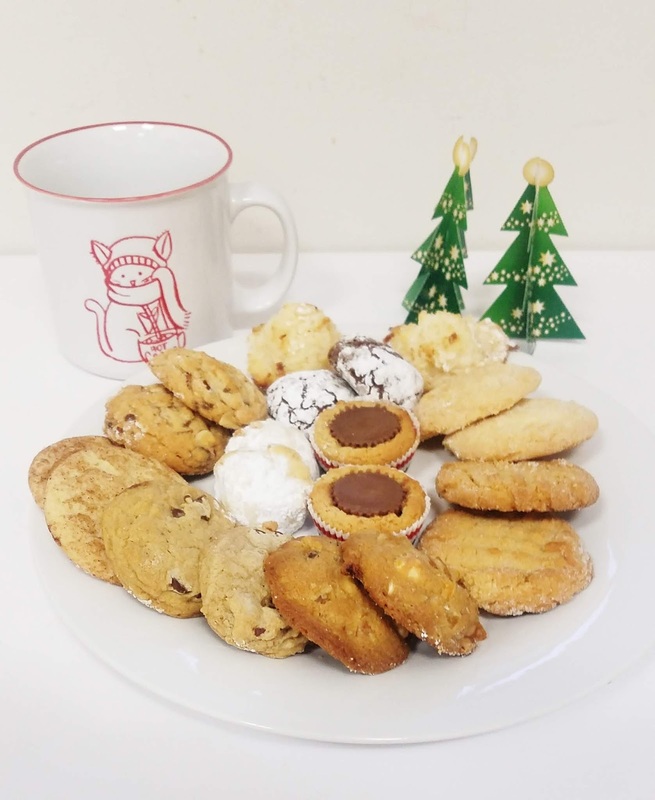 This cookie plate was from one of my team mates. His mom and girlfriend baked these cookies. 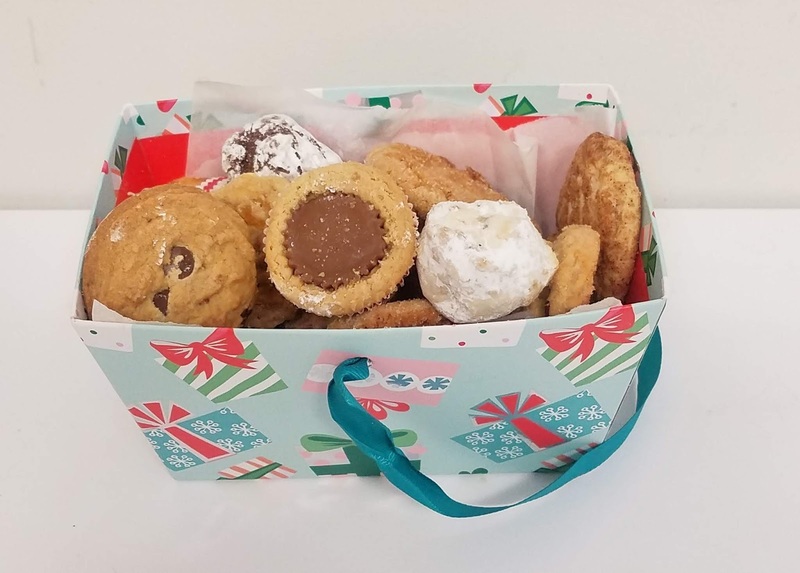 He told me that he has a cookie box just for me so I put these in the staff lounge to share. As my team mate has promised, my very own cookies! And I kept for my own except Mr Sweetie ate a lot of them! Something I look forward to every year is our cookie exhange party at work. We also have savory stuff like pigs in a basket, potato patties and potato pancakes and coffee. Here are the cookies that I collected. I wrote about about yearly shopping lunch at Copa Cobana here. 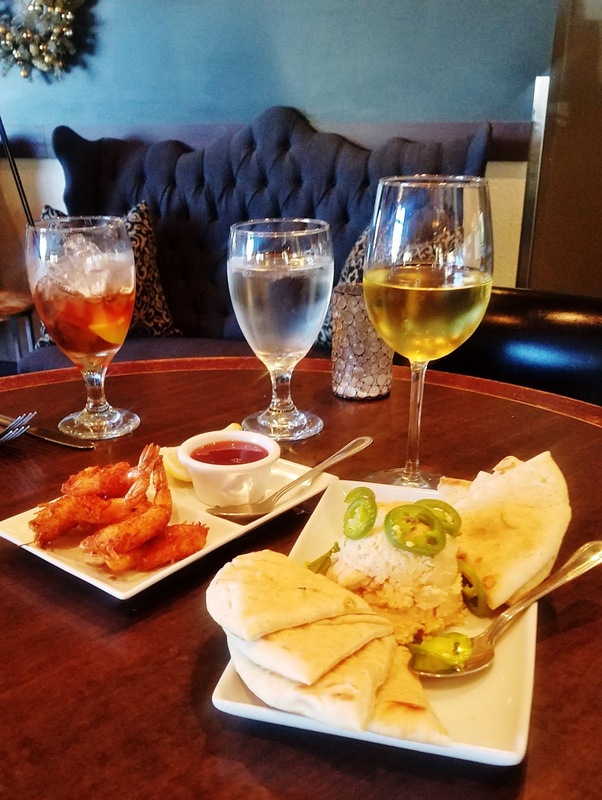 Delish hummus, patatas bravas and coconut shrimp washed down with a glass of bubbly. Oh, how I dream of this moment every year with my girlfriend, Jax. 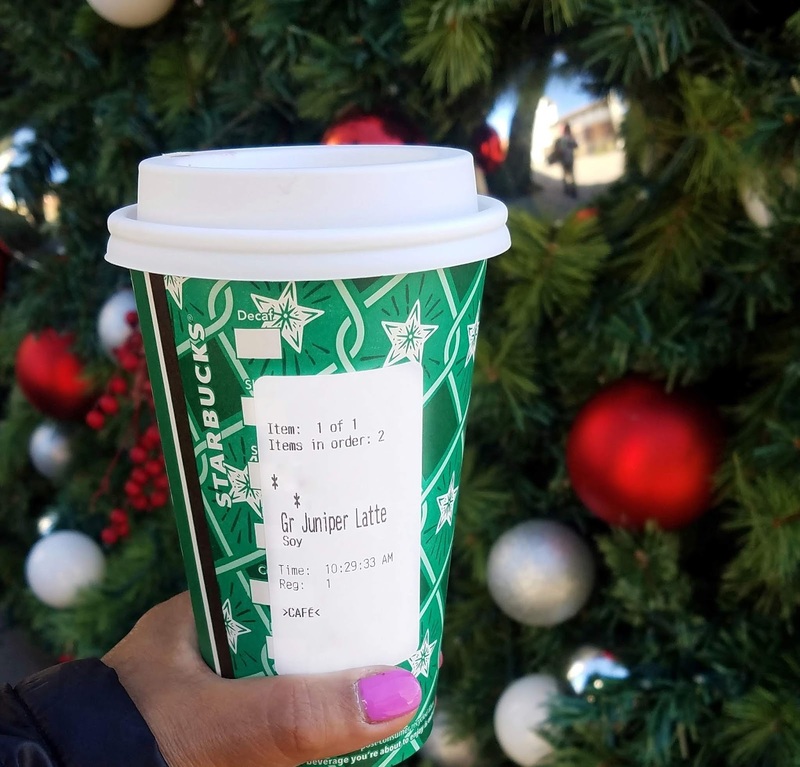 I really do not drink Starbucks outside of the holidays and only mostly when I am traveling. I just do not like sugary drinks except as occasional treats. This is my second Starbucks coffee this season. I could not resist trying the Juniper Latte and it was delicious! I was late for one of our work holiday parties. (We have multiple parties all throughout December!) It was still nice as the venue by the water was lovely. There were tons of food but I went for the string beans and tofu, an eggroll and beef pozole. I really enjoyed them! What happens at the office staff lounge stays there. Just like that one evening where we turned it into a mixology bar. While the company was having an official holiday party downstairs, my co-workers turned our suite into another party. They brought alcohol, started mixing and just grabbed people who happened to walk in to party with us. For appetizers they "stole" appetizers from the actual party and brought them to our suite. I did not even go to the main party and just stayed at ours which was more fun. I had an Aperol Spritz and a bunch of mini-eggrolls. That for me was my work holiday party for this year, and I would not have it any other way! 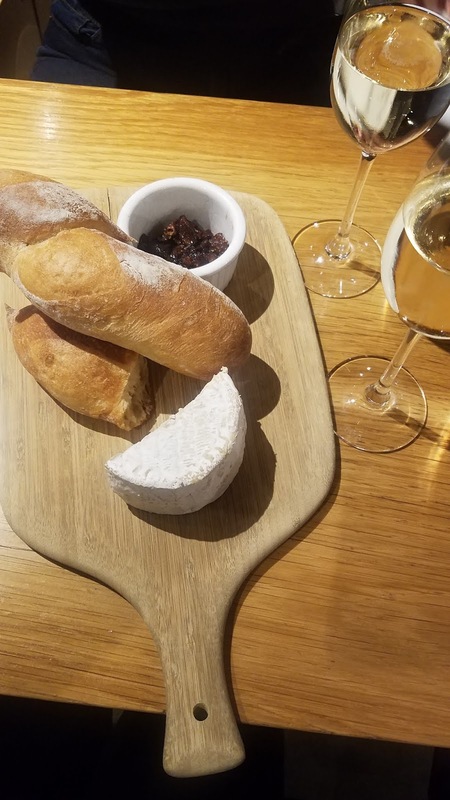 A blissful couple of hours with BFF noshing on delicious Cowgirl Creamery cheese, chutney, Acme sourdough bread and sharing a bottle of delicious champagne at our BFF HQ. BFF HQ being the San Francisco Ferry Building which has been friendship headquarter for years. She brought me presents from her as well as from Jax. There were magical hours of just being BFF's reminiscing, enjoying the SF food scene and plotting our next adventures in 2019. We are adding this to our list of our BFF holidays traditions. The mom in law called a family meeting over dinner regarding family Christmas party planning. Mr Sweetie and I are hosting it at our suburb house. She cooked ribs, potato salad and corn on the cob. 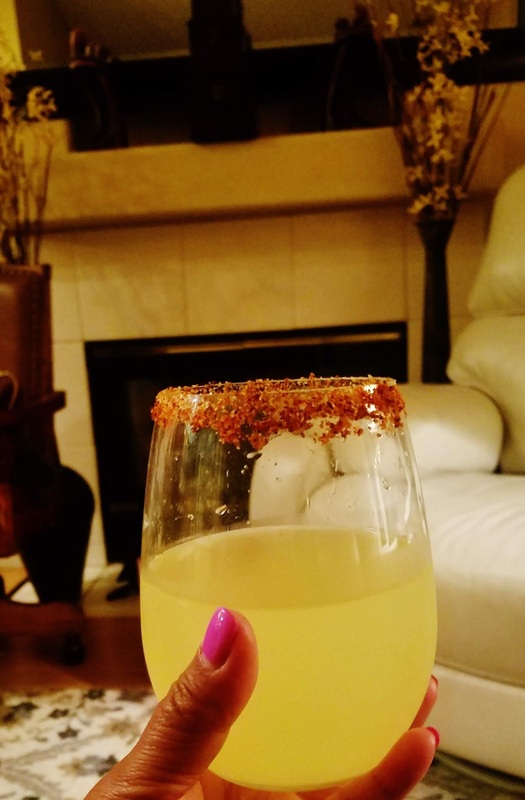 As always the women had wine and margaritas. It was a nice dinner. I will not put these as an item but I made scrumptious Chai Masala Snickerdoodle Cookies from A Cozy Kitchen blog. Everyone at work loved them, Mr Sweetie devoured them and the repair men who worked on our water heater at home finished them. Ha! Ha! Just look at these cookies that I posted here. I will make them again and again! Stay tuned for Eating Through The Holidays Part 2 because there will be delicious eats to come, and the holiday season ain't over yet!